When a defective product causes an injury, the companies responsible for the manufacture or distribution of the product may be required to compensate the victim. This applies to everyone involved in the manufacturing and marketing of a product, from the companies that create component parts to the retailers who sell the finished product. The area of law attorneys refer to in lawsuits involving defective products that cause injuries is called product liability law. Product liability law is actually a collection of state laws. Because no federal product liability laws exist, the United States Department of Commerce has encouraged states to abide by its non-binding Model Uniform Products Liability Act (MUPLA). But in reality, product liability lawyers rely more on the laws of the state in which the lawsuit is filed for guidance. Depending on the jurisdiction, product liability lawsuits may be filed based on liability, negligence or breach of warranty. The best way to find out which of these apply to your jurisdiction is to speak with a personal injury attorney. Within the context of product liability law, the term "product" can be taken to mean anything that is purchased, from pets and appliances to houses and gasoline. Below are some of the categories defective products often fall under. Airbags. While airbags have saved thousands of lives, they have also caused injuries and deaths. Since 1990, airbag deployments have killed 175 people, 104 of them children.1 Airbag injuries have included broken bones, facial injuries and eye injuries. Airbags can cause injury even at low speeds. Some of these injuries occur because of one or more of the types of product defects listed above. A product liability attorney can help determine if someone injured by an airbag is eligible for compensation in the form of a settlement or court award. Dangerous products affect all sectors of society. In 2001, Niki Taylor, supermodel and co-host of the new television show Make Me a Supermodel, sustained life-threatening injuries from an automatic seatbelt. Seatbelts. Wearing a seatbelt is always the right decision. However, seatbelts with defects have led to many auto accident injuries that otherwise would not have occurred and have worsened injuries that otherwise might have been less serious. When seatbelts fail to restrain passengers properly, passengers can be propelled forward, striking their heads on the dashboard or windshield. Faulty seatbelts have also resulted in injuries to the liver, spleen and spinal cord. In some cases they have even caused decapitation or paralysis. Rollovers. Vehicle rollovers are a significant contributor to auto accident injuries and deaths. From 1990 to 2000, more than 12,000 people were killed in vehicle rollovers.2 SUVs and 15-passenger vans are particularly prone to rolling over. In recent years, auto manufacturers have been forced to recall vehicles that are dangerously susceptible to rollovers, such as the Ford Explorer. But despite these recalls and the efforts of consumer advocacy groups such as Public Citizen, some auto manufacturers continue to lobby against additional safety measures. Defective tires. 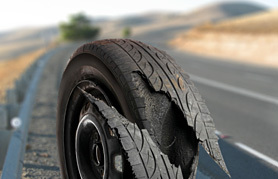 Defective tires are often to blame for rollovers and fatal car crashes. The Ford-Firestone rollovers alone caused 300 deaths. The FDA has advised patients with this device to seek immediate medical attention if they experience fever, constant abdominal pain or tenderness at the implant site. Guidant Pacemakers. On the heels of its ICD recall (see above), in July 2005 Guidant recalled nine of its pacemakers from the market after it was discovered that a seal in the devices was prone to leaks. Leaks allow moisture to get in, which damages the electronic circuits, leading to rapid heart rate and/or causing the pacemaker to stop providing pacing. The resulting health complications include loss of consciousness, heart failure and death. Guidant Ancure Stent. The Ancure Stent was the first product approved by the FDA to treat abdominal aneurysms. Developed in Taiwan, it was later manufactured and marketed by medical device manufacturer Guidant. The company recalled the product after researchers discovered that one of its components harmed the already damaged arterial wall, which in turn could cause the artery to rupture. Medtronic Recalls. Medtronic is one of the world's largest medical device manufacturers. Though it has had many successes, over the years the company has also been forced to recall some of its devices. In 2005, Medtronic's Sigma series pacemakers were recalled due to faulty circuitry wiring that could cause the device to malfunction. Medtronic was also forced to recall its Micro Jewell II GEM DR implantable cardioverter defibrillator after it was found that a component responsible for delivering the electric shocks the product produces was defective. Patients using this device should consult with their doctors immediately to determine the best course of action. The discovery of this defect has left patients in a difficult position, because replacing implantable defibrillators can be dangerous. Some patients may have grounds for a lawsuit. If you are a patient using the Micro Jewell II GEM DR, you may want to speak with a defective products attorney to determine whether you should attempt to reach a settlement or file a lawsuit seeking compensation. Consumer products are items used in the home, in schools and in many other locations. The U.S Consumer Product Safety Commission (CPSC) monitors the safety of these products. People who have been injured or harmed by a defective consumer product should contact the CPSC by calling 1-800-638-2772 or by sending an e-mail to info@cpsc.gov. You should also consider speaking with a product liability lawyer to determine the best course of action. In addition to keeping watch over more than 15,000 types of consumer products, the CPSC is also responsible for issuing recalls when it determines that a product is unsafe or defective. To report an unsafe or defective product, contact the CPSC. If you or someone you know has been injured or harmed by a consumer product, it is extremely important that you speak with a defective product lawyer as well. Defective drugs have been found to have side effects that put consumers at risk of serious health problems. When the FDA determines that a drug is hazardous to the health of patients, it issues a recall to remove the drug from the market. Below is a list of drugs that may have caused injury or wrongful death in recent years. If you believe that you or a loved one has been harmed by one of these drugs, it is very important that you contact a product liability attorney or in cases of death, a fatal injury attorney immediately. Read more about these defective drugs. If you or someone you know has been harmed by a defective product or drug, you may be able to obtain compensation by filing a product liability lawsuit, or by reaching a settlement with those responsible. Defective products belong to a class of liability known as "strict liability," which means that you do not have to show that the responsible party was negligent or knew that the product was defective. The fact that the product is defective is sufficient. Contact a product liability attorney for more information. The Ortho Evra contraceptive skin patch may be more dangerous than the pill. A study conducted by the Boston Collaborative Drug Surveillance Program showed that women using the Ortho Evra patch have a higher incidence of blood clotting than those taking the pill. As a result, in January of 2008 the FDA issued an order requiring the patch's manufacturer, Ortho-McNeil, to change the label.